The 10-month-old girls from North Carolina were born connected at the head, an extremely rare condition. Following months of planning and preparation, the pair underwent a successful 11-hour separation surgery last week at Children’s Hospital of Philadelphia, according to the hospital. “Separating conjoined twins is a very complex surgery followed by a long and complicated recovery, but we are very hopeful for a positive outcome,” Jesse Taylor, a plastic surgeon who co-led the operation with neurosurgeon Gregory Heuer, said on Tuesday in a statement from the hospital. 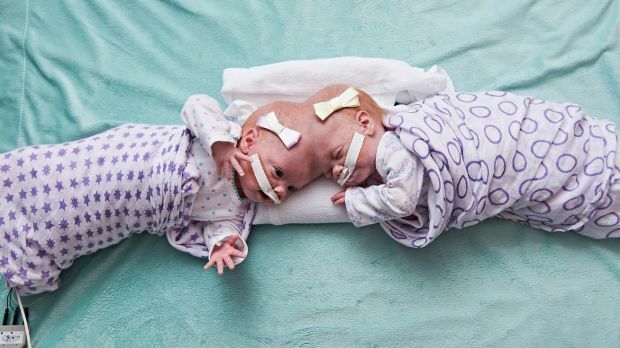 With identical twins, an embryo splits in two early in a pregnancy; but with conjoined twins, the embryo does not separate all the way and the twins remain connected, according to the University of Maryland Medical Centre. Conjoined twins are uncommon, occurring once in about every 200,000 births – and craniopagus twins, those who are connected at the head, are the rarest form, accounting for about 2 per cent of conjoined twins, according to the medical centre. Abby and Erin’s parents, Riley and Heather Delaney, learned that their girls were conjoined early last year when Heather Delaney was about 11 weeks pregnant. Although it was too soon to know whether the twins would be able to be separated, Heather Delaney started travelling from North Carolina to Pennsylvania for her prenatal care. Eventually, she moved into a hospital facility in Philadelphia for mothers carrying babies with complex congenital conditions, according to the hospital. On July 24, 2016, Abby and Erin were delivered by C-section 10 weeks prematurely, each weighing about under a kilo, the hospital said in a statement. The night before the Delaneys’ surgery on June 6, someone posted on a Facebook page set up for the twins. Children’s Hospital of Philadelphia said about 30 doctors, nurses and other medical personnel worked to separate the twins – a first for the hospital. The hospital said it has separated 22 other pairs of conjoined twins over the past 60 years but never a pair of craniopagus twins. The surgery was meticulously orchestrated: Surgical equipment was colour-coded with green and purple tape – one colour assigned to each patient. The medical team worked essentially on one body – and then once the girls were separated – the team split to care for two.